Most people associate the word mocha with coffee. For some it may be a type of coffee bean with a rich deep taste, usually from Yemen or the Horn of Africa. It may also refer to a sugary concoction of coffee mixed with chocolate. For espresso aficionados, a moka is an hourglass-shaped stovetop coffee maker that percolates the beverage upward through the use of steam pressure. This book brings the term Mocha back to its historical root—a port city on the Red Sea coast of Yemen that the Ottomans cultivated in the early sixteenth century. Known in Arabic as al-Mukha, this small but vibrant port bustled with activity through the nineteenth century. Merchants and pilgrims arrived at Mocha’s jetty from South Asia, the Persian Gulf, the East African coast, other cities in the Middle East and Europe. 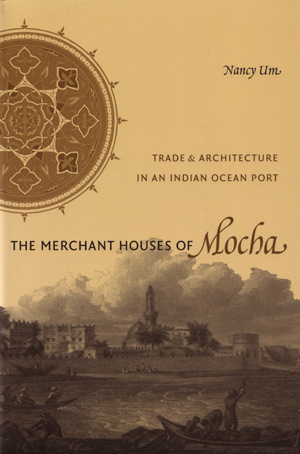 The Merchant Houses of Mocha considers the social structure, the key personalities, the urban shape and the architecture of this vibrant city during the late seventeenth and early eighteenth centuries, an era when merchants flocked to it in search of valuable commodities such as coffee, but also spices, bulk metals, Indian textiles, aromatics and dyestuffs. My main contention is that the practices and the protocols of cross-cultural trade were not just economically significant to the city’s livelihood. Rather, the social, cultural, and even spatial dimensions of the trade played a shaping role in determining Mocha’s societal structure, its urban form and layout, the character of its institutions, and its architecture. Furthermore, the effects of the Indian Ocean trade, as filtered through the city of Mocha, penetrated into the heartlands of the southern Arabian Peninsula, reaching even its most inaccessible and remote mountain fortresses.